As the food media dies down the food world grows larger. We still need professionals reporting on food but we dont need 100's of them to tell us how to eat anymore. The www is a hub for finding good food, you just dont need someone to find it for you anymore. Cookbooks are still valuable but you can find any recipe you need on the 'net. Today we try a few I found. I made some some homemade mango chutney recently after having a taste of an awesome batch up in Toronto. Since this was my first go around I made what seemed to be a pretty easy recipe. I was really surprised by how good this turned out. It didn't last a week in my fridge due to the fact its such a versatile condiment. My main objective for its use was to make lamb burgers which I was doing but then someone on twitter suggested I try making bhel puri with it as well. So before I knew it I had plans for dinner. What a great summertime snack! For the burgers I followed a recipe with ground lamb and mixed up a paste consisting of ginger, garlic and onion. I then spiced the meat/paste mixture with chilli powder, garam masala and cumin. Molded together with bread crumbs and an egg. 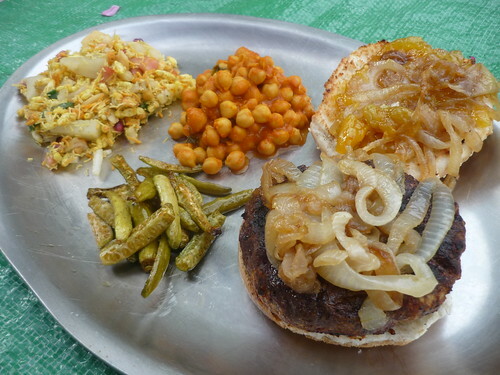 Spread the Mango Chutney on top part of a toasted bun and then the grilled onions go on the patty. Serve with London Pub style steak sauce. Got all the ingredients but the lamb at Patel brothers on Devon where I also grabbed some tindora to roast with it. Had to have an order of channa masala from Ghareeb Nawaz too since I was so near. Good to be back grilling. A Bridgeport favorite from the 90's has returned and the residents around the area couldn't be happier. Well maybe if the White Sox won a series. But they cant seem to do that huh? Well at least they got a winner in Soluri & Sons Italian Deli now open again on Halsted. You might not see their small storefront on the 3500 block of south Halsted if just cruising by but you're going to want to know where this place is. As you walk in you're greeted by those behind the counter with the menu painted on the right side of the wall. Sandwiches are what they do here and they take them seriously. Every last ounce of meat is weighted so their meat to bread ratio is spot on and your sandwich is sensational. My first trip thru I had to go classic so I went with the Italian of the seven poor boys (sandwiches) offered. Could this be the new king of the sub sandwich in Chicago? I'm not taking sides but it can certainly be mentioned when talking about who's is best. The bread comes from most folks favorite in D'Amato's. High end meats and cheese are topped with house dressing and dont skip option of their homemade giardiniera, its fantastic. They also sell D'Amato's pizza bread and make homemade Italian sausage for your grill. Good to have y'all back! 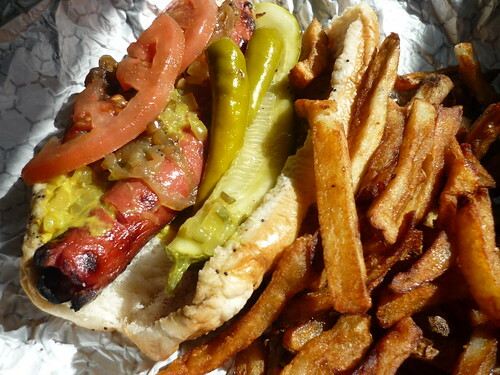 Phil Ashbach knows Chicago style fast food. The man who's first name dons Phil's Last Stand on Chicago avenue in the Ukrainian Village neighborhood spent a lifetime eating at every last hamburger and hot dog stand that this city has. He's been in the hot dog game for over 40 years now having started off as co-owner of Herm's Hot Dog Palace in Skokie. After quitting that he helped raise his family while continuing to eat plenty around town, the man isn't small. As the kids grew up and went their own ways Phil decided to get back in the game with the opening of one last stand. A sign inside the place tells the story of Phil and how he's the original "foodie expert". Before social media was buzzing over some drugged out chef making some small plate dish that mixes goose poop with sea urchin, Phil was exploring Chicago's food scene while sacrificing pounds to his frame. You can tell with the food. 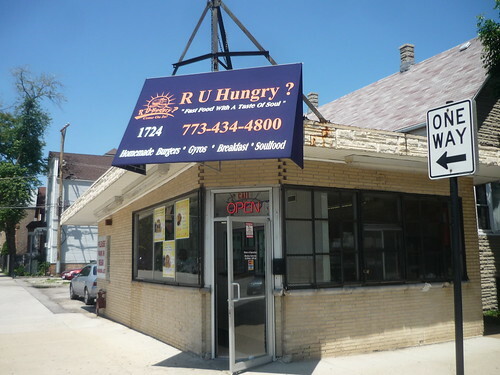 This is a classic Chicago style fast food shack. To be that you need a top notch hot dog. Phil's does char dogs which rival the Wieners Circle. The fresh cut fries are perfect and while you wont get any vanilla shakes from him you will get a laugh as he's usually there manning the register. Aside from the usual offerings theres some other stuff here you wont find elsewhere. 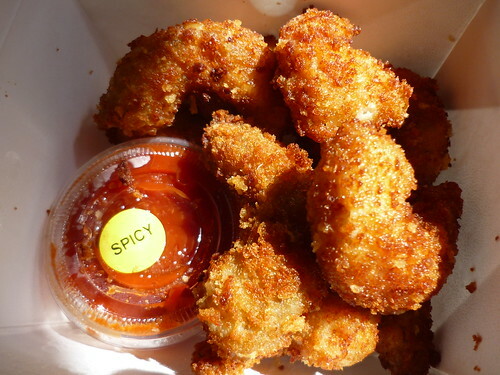 They do fried shrimp which is a popular thing to eat in Chicago. They also happen to have some secret menu items ala in and Out and their fried shrimp po' boy is one of those. I dont know if po' boy is the right word to describe this sandwich. I guess its kind of like one had mated with a frita cubana. The shoestring potatoes with secret sauce and their pretty powerful panko crusted fried shrimp (avail. by the pound) make for a tasty treat. The menu item for me that sets Phil's apart from many is their hamburger. They're made in the style of In and Out which I actually wasn't all that impressed with when I went in Las Vegas. 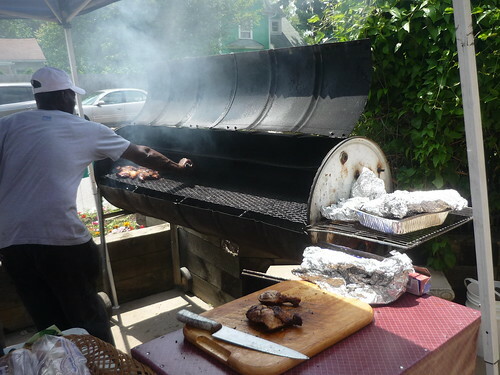 But the difference here is they get a little taste of Chicago by cooking the patties on a char grill. It makes a huge difference and pairs well with the thousand island style sauce they use to make these "fatso" style burgers. A double with cheese and a medium lemonade and grape mixed drink is all I need when I'm hungry and in the mood for some fast food. I'm honered to wear Phil's old crown as the king of Chicago style fast food and bless his last stand. Amen. Double Fatso with Cheese? YES PLEASE! 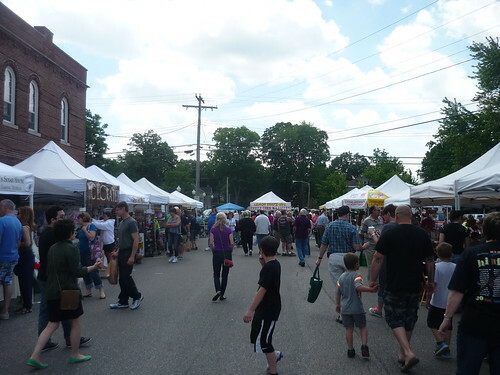 I took a walk thru the popular European Market in historic downtown Chesterton which is open Saturdays in the beginning of May thru the end of October. This is about an hour drive from Chicago and not far from the lake so if anyone is looking for a fun Saturday activity, the beach and a trip here aint bad. There were a few local farmers here selling that which they've grown but not as many as I would have liked to see. Maybe the number increases as summer and fresh fruits and vegetables come into full swing. There seemed to be alot of people selling canned goods and other fun stuff that they made elsewhere and sell here. The food options are pretty damn good. There's an Amish corner here where they have a few tents set up selling goods. 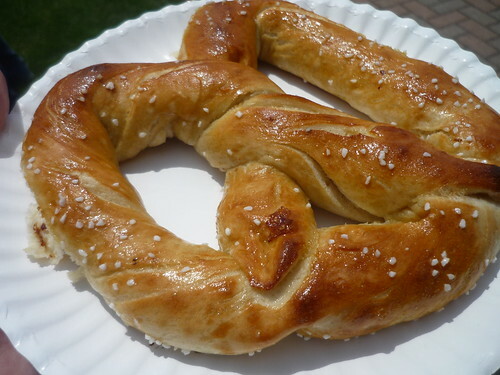 The soft pretzel from Ben's was as good of any I have had. Right next to Ben's was a tent where they were offering what I thought looked to be like the best buy at the Market on our visit. An Amish lady had a package that included a huge two pound bag of homemade noodles along with a dozen fresh eggs and a 1 pound stick of butter for $20. If I had access to keeping those cool and safe I would have bought but I didn't so next time. The most popular spot to eat at here has to be the Rolling Stonebaker. 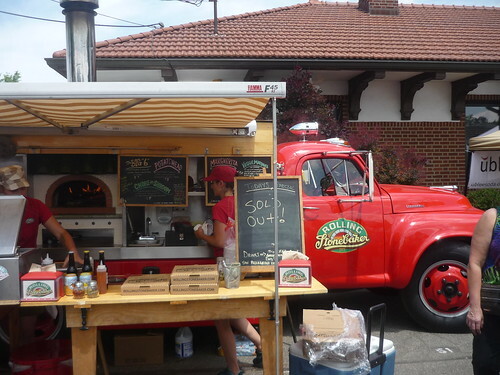 The couple that runs this amazing wood fired pizza truck that is based out of Beverly Shores is doing things right. One day they decided to chase their dream and now they're living it. You can find them roadside in Beverly Shores (Corner of US Highway 12 and Broadway) weather permitting. They also have a 2nd truck which parks at the Market each Saturday its running. 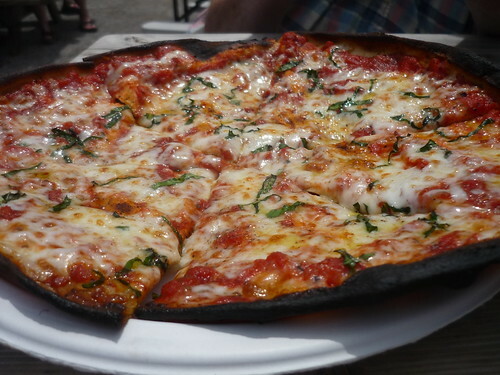 Their market special pizza is always special but it they're out of that the margherita and regular mainstays are all fantastic. I couldn't help but notice while we were walking around that the place didn't smell like a European market, it smelled like some street corner in the Caribbean. 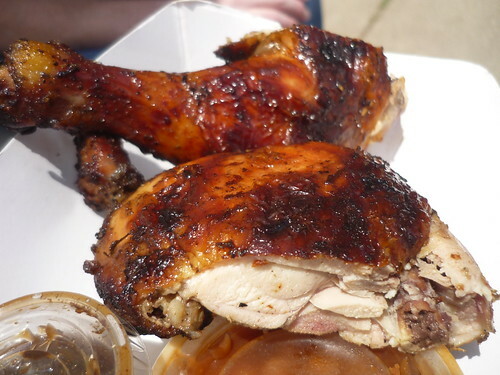 Then we passed some guys on the corner across from the antique shop who had a whole setup going for island grilled jerk chicken. It smelled too damn good not to stop. Along with the jerk they also serve KC style BBQ but everyone was eating the chicken which was making the place smell great so thats what I tried. It was very good. While I would of liked maybe a little more punch from the sauce itself the chicken was moist and the tastes of the islands were there. Fun day. Sure we like to cover the less talked about mom and pop spots over here but that doesn't mean we dont get to the upscale new places taking the city by storm. Of course when we do it's never comped and isn't some special blogger invite party. I've never gone to one of those despite being invited to many. Free food isn't what we set out to do and I like to give places plenty of time to find their groove. Exposing good food is the only real goal. Our family did a Mothers Day dinner* at Trencherman recently and everyone left impressed. Located in an old bathhouse Trencherman is continuing the weird that went on there back when. Run by two brothers their menu isn't normal and some things make you wonder if that would work? Yep it pretty much all does so in perfect harmony like the '96 Bulls. Its an eclectic mix of pairings you might not have ever seen elsewhere. Their signature dish the Pickled Tots have remained on the menu since the opening and are the perfect plate to try so you can get an idea of what I'm talking about. We had a table of 8 which allowed for tastes of most everyone plates. They almost batted 1.000. The only thing I wasn't impressed with was the fried chicken. It wasn't bad it just didn't do anything for me and was pretty normal compared to everything else. The menu switches up but the aged duck, the pork loin, steak and walleye were all wonderful. My mom got a prixe fixe course that included a piece of sea bass cooked with miso that she said was one of the best pieces of fish she ever ate. The also have a bar with a separate menu and do brunch. Everyone agreed we'd have no problem going back. *Ok so the meal was comped...by my dad. As I was cruising thru the Back of the Yards on business recently I noticed a place advertising their homemade food and took note. It was a Sunday so they were closed, I decided to return a few days later while going south on 90. I was greeted by some nice folks behind the glass who were happy to have me. Glad I decided to stop in here. It'll be in my regular rotation when in the area. Which isn't often but nonetheless others are. "Fast Food with a taste of Soul" is what they do. As we got to talking the owner explained how aside from the gyro cone "everything we make comes from scratch". Menu has a few Chicago food staples including some Chicago Style Soul Food. Available in the winter the Pac Man is a sliced charred Polish sausage topped with chili and onions (option of cheese) served over Dirty Rice. 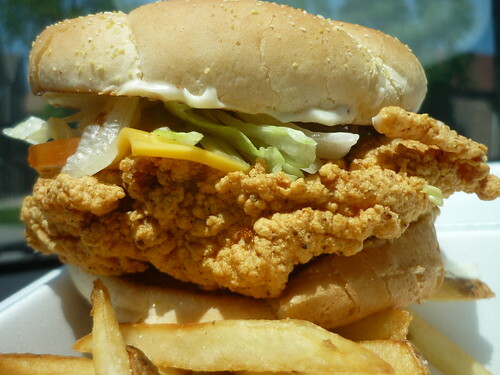 Fish/chicken/pork sandwiches + burgers are all hand breaded/packed to order. Wendy should be ashamed. This is the best damn spicy chicken sandwich I've ever had. Seasoned with spices mixed into a cornmeal coating this sandwich definitely had soul. It could of got a deal with Vee-Jay Records if it had been around back then. Not only is the food made from scratch but its a steal of a deal. I got an order of wings on a recent visit for $3 with fries. Well worth it. Soul Food offerings vary by day. A Mama someone comes in with her recipes on the weekends (Fri & Sat). 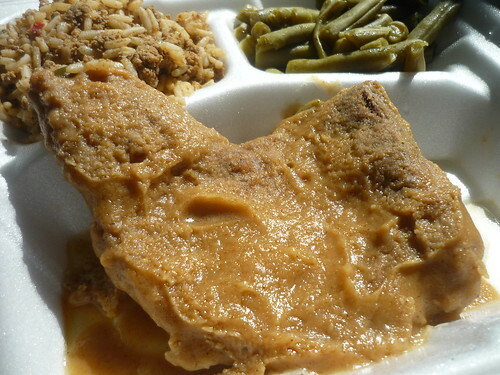 I took a smothered chop with dirty rice and green beans lunch plate to go and enjoyed it. Both the sides shined and the chop was tender with the sauce similar to a gumbo base. For $10 total for the sandwich and chop I thought the place was great. Real red Kool-Aid is available for $1 for an 16oz and $2 for a 32. If sugar water isn't for you I hope Wildwood pop will do. Some good ballistic glass dining. Festival season is in full swing. I didn't get a chance to go to many last year. I just wasn't in a rush. But I did attend both the Strawberry and Apple Fest in the historic suburb of Long Grove last season. Strawberry Fest is coming up (June 21st-23rd) so I thought we would get this up a week early so families and couples could make plans. About 30 minutes from Chicago in Lake County sits the affluent suburb of Long Grove. Its one of the cutest little suburbs in the state. In the 1950's they passed an ordinance that opposed major developments so it's charm remains today. There's a covered bridge, ponds and some beautiful old buildings and homes to be seen as well as a quint little shopping district downtown. That's where they hold their annual Strawberry and Apple festivals (Sept.). Last year we attended Strawberry Fest and it was hot as hell out. The weather should be better this year if what we've had so far remains. While you might think attending a festival in a small suburb would be much less stress than the city that's not quite the case. They come from all over for this and every last parking spot available is taken during peak times but people come and go so getting a spot isn't too hard. I enjoy it because of the charm of the area. You feel light years away from the city when visiting. Its a great place to spend the day walking around while enjoying the weather. Of course the other fun things about festivals are the food and drink. I love festival food and I aint afraid to admit it. There's some good options here as far as food goes. Then there's also the Village Tavern where you can step inside away from the heat and drink some refreshments while cooling down. They get into the theme too and have strawberry brews and cocktail concoctions. The beer garden is next door and all the food stands and bands line the streets of downtown. Enjoy the tour. We didnt get a chance to celebrate National Hamburger Month last May due to a different theme. So this means is it's time for another "5 More..." We understand if you're sick of burgers and lists for them but its what we've ate from the get go here. I like them and one of the reasons is you can be almost anywhere and find a place thats been doing them the right way for a long time. If S'C'&C isnt a great resource for burgers from around this region I'll be damned. I'll just continue to eat more and wont stop because people are sick of it. So without further ado I give you five more burgers served in Chicago I give my blessing too. Just like another popular spot in the area, Flub a Dub Chub's is a hot dog stand that puts out a really good burger. Located in a space formerly occupied by a cleaners this is a newly aged classic Chicago style fast food stand. From good friendly people who run it down to the classic food you find in these establishments. The Roe Burger will make you happier than the folks that live up around this way. It's a big happy hamburger. A 1/3 pound of fresh beef is char grilled and topped with melted cheddar along with thick cut bacon and sliced avocado. Normally I dont really like pretzel buns but this one holds all that goodness together. 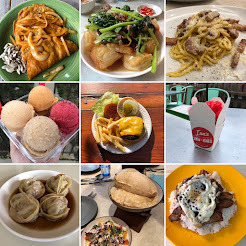 Up in Andersonville there's a handful of spots that dont get the praise and press of trendier River North establishments but people are still finding their way there because theres no one single authority on food anymore. Big Jones is a really good place for a date or if you dont have one, a great spot to drown your sorrows in some whiskey and spend some time with this baby below. Their pimiento cheese burger from the dinner portion of the menu is one of my favorites in the city. You dont find many places doing a take on this southern specialty. Made with house chow chow and pimento cheese, both southern staples, it comes with two juicy patties and grilled onions too. Add a side of their fried sides and I'm good to go. Tavish in Lincoln Park has been around for a while now. There was a time when I used to frequent the building it sits in for the purchase of fireworks, baseball cards, cap guns, candy cigarettes and other fun stuff. The Tavish burgers here were named one of the cities best by the Tribune over a decade ago and they're still really good. Mini burgers come cooked to desired doneness with a pickle on top and their house cut chips. Nothing fancy but something that definitely kicks the itch for a cheeseburger when it hits. There's tons of best burger lists out there. A place you're likely to see on many Chicago ones is Cortland's Garage. I know I read about it from one of them out there. For whatever reason it took me a couple years to try one. I shouldn't have waited. Their signature offering with avocado, bacon and onion strings with fresh cut fries is one of the best bar burgers in the city and worthy of being included in whatever list it was I read. A little example of social media marketing at work here. I was watching the 1st round set of games of the NCAA basketball Tourney this past March when someone re-tweeted a tweet from The Anthem in Ukrainian Village. It mentioned that they had all the games on their TV's and their Juicy Lucy was 1/2 off on Thursdays. So I went over to watch a half of games and have one. The Juicy Lucy FYI is a specialty burger from the Twin Cities. It's stuffed with cheese which oozes out when eating one. Anthem is an updated retro sports bar so there's plenty of TV's and beer options available if that what you're looking for. I was able to take a seat amongst the Broseph's for a beer and order a burger. Not bad. I think it was $10 regularly priced so having paid just $5 for it with the fries this was a good deal. I thought it was a pretty good representation of this style. As far as bar specials go, this was a good one.